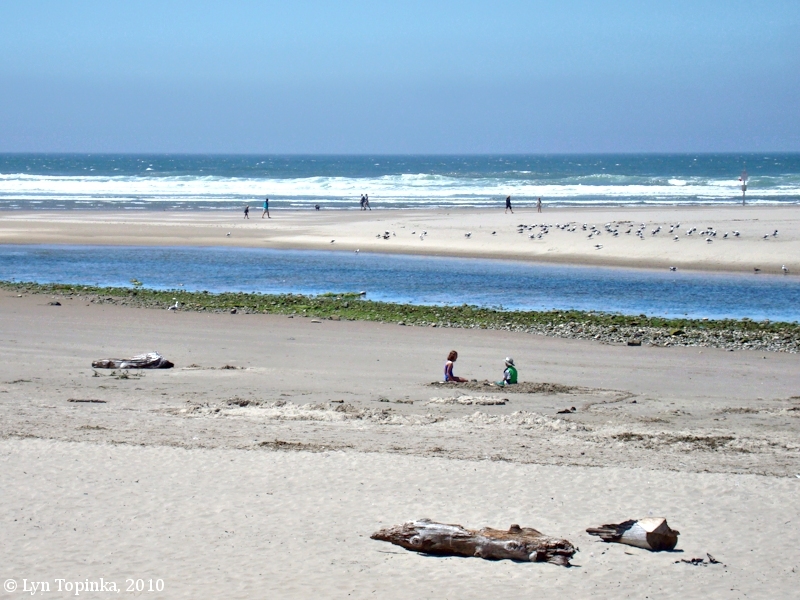 Click image to enlarge Ecola Creek entering the Pacific Ocean, Cannon Beach, Oregon. Image taken July 14, 2010. The mouth of Ecola Creek enters the Pacific Ocean at the north edge of the Oregon community of Cannon Beach and its picturesque Haystack Rock. 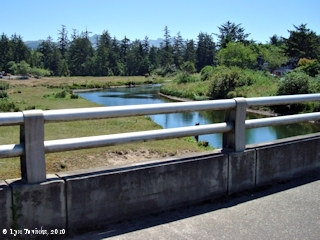 The Ecola Creek watershed drains approximately 22 square miles, with the entire basin lying within six miles of the Pacific. Maximum elevation is 3,075 feet. North of Ecola Creek lies Ecola State Park. 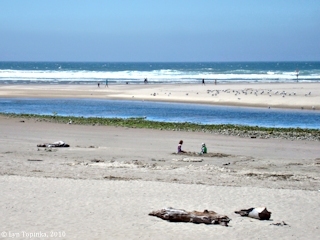 Click image to enlarge Ecola Creek, upstream from the Pacific, Cannon Beach, Oregon. Image taken July 14, 2010. 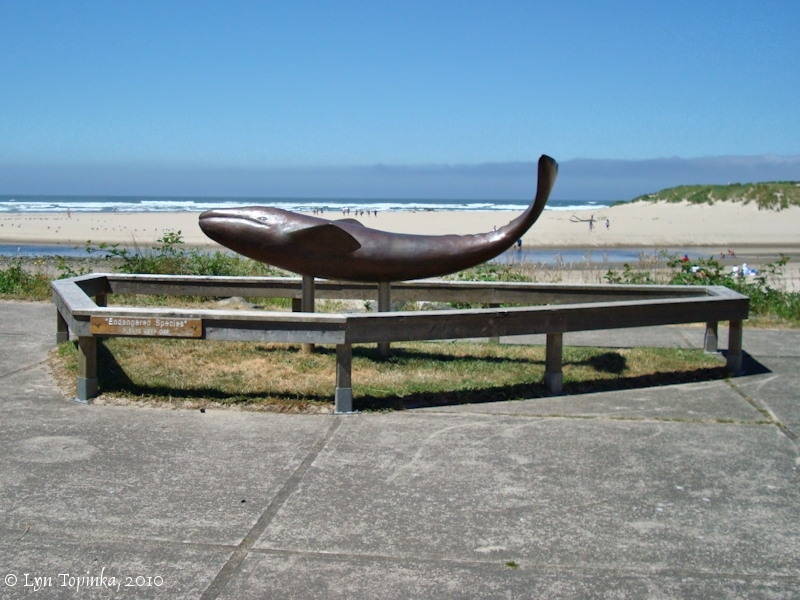 Captain Clark crossed Ecola Creek on January 8, 1806, on his visit to see a Blue Whale. He also gave it its name. Captain Clark camped on the north side of Ecola Creek on January 8, 1806. Click image to enlarge Whale, Ecola Creek, Cannon Beach, Oregon. Image taken July 14, 2010. 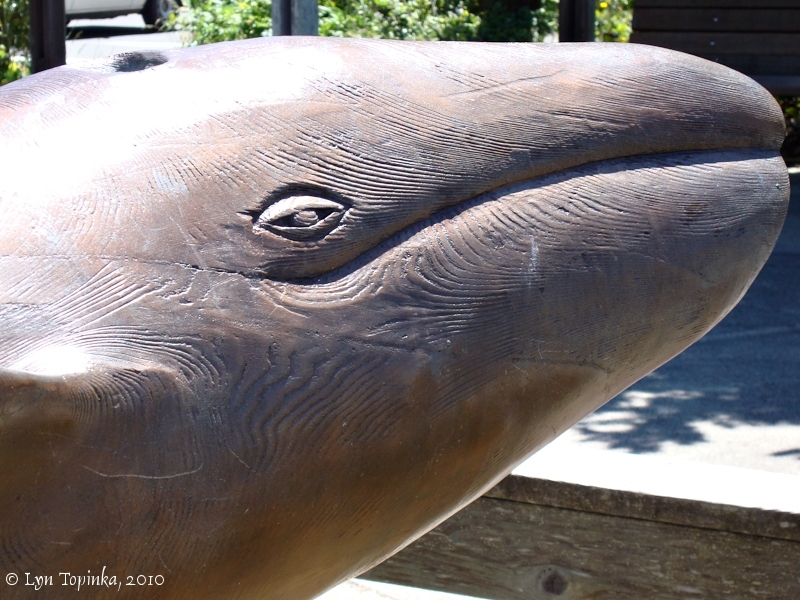 The original name "Ecola" came from Captain Clark on January 8, 1806, and was the native name for "whale". The 1940 NOAA Chart "Yaquina Head to Columbia River" (#5902) shows today's Ecola Creek labeled Elk Creek. Also labeled are "Cannon Beach" and "Haystack Rk.". 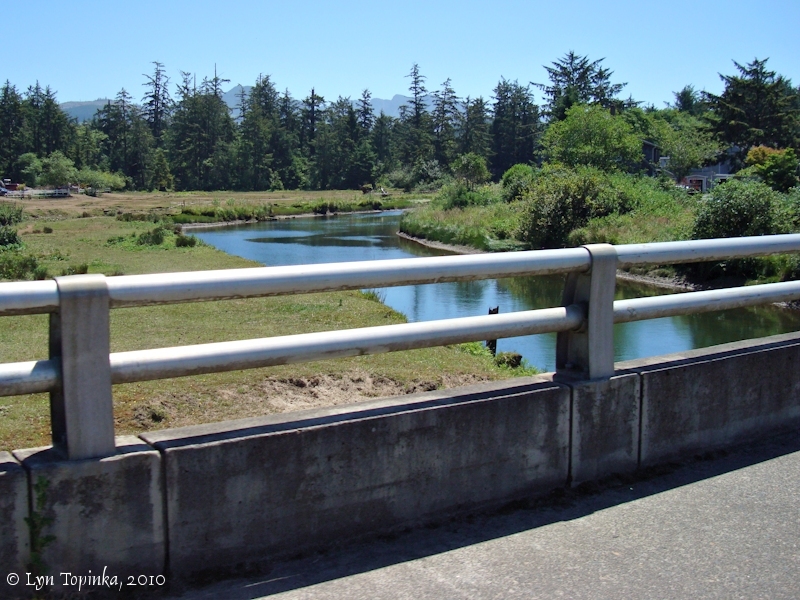 According to the Ecola Creek Watershed Council (via Oregon State University Website, 2010) the use of "Ecola" was not fully accepted by early white settlers who called the creek and the community which grew up on the south shore of the creek "Elk Creek" (today's Cannon Beach). However, as many other communities also answered to "Elk Creek", the name "Ecola" came back into use. In January 1974 the U.S. Board of Geographic Names made "Ecola Creek", "West Fork Ecola Creek", and "North Fork Ecola Creek", the official names for what use to be known as "Elk Creek", "West Fork Elk Creek", and "North Fork Elk Creek". 1869 Coast Pilot, "Ecola or Whale Creek": The "prominent cape" is Tillamook Head. "... This prominent cape, in latitude 45o 58', is twelve miles north-northwest from Cape Falcon, and nineteen miles southeast by south half south from Cape Disappointment. The coast from Cape Falcon curves two miles eastward; is bold and rugged, guarded by many high rocky islets and reefs, and in several places bordered by a low sand beach at the base of the cliffs. 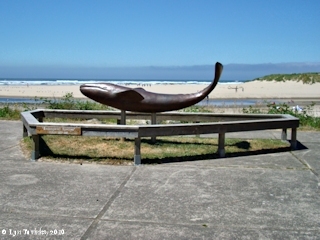 Two miles south of the head, Clarke (1805-'6) locates a creek, eighty yards wide at its mouth, which he calls Ecola or Whale Creek. ..."
"... Exactly half-way between Cape Falcon and Tillamook Head a secondary ridge comes from the eastward with an elevation of then hundred and fifty feet at a little less than two-thirs of a mile from shore ... From Midway Cliff the shore continues in a straight line north-northwest for two and two-thirds miles to the mouth of Ecola Creek; thence it turns sharply to northwest half west for the same distance to the westernmost point of Tillamook Head. "... The shore approaches to Tillamook Head from Midway Cliff (five and a third miles to the southward), are moderately high and wooded, and run straight north-northwest to the mouth of Elk or Ecola Creek, with a broad low-water beach. At one and a half miles from Midway Cliff there is a cluster of rocks covering an area of four hundred yards, and stretching out from the low-water line to ten fathoms. The largest is two hundred and fifty yeards in extent and two hundred and thirty-five feet high, which is higher than the adjacent, slightly broken shore. Two smaller rocks on the south side of the large one are ninety-three and seventy-eight feet high. At two and a half miles from Midway Cliff the Ecola Creek enters, with a broad, retreating mouth, low cliffs and land on the south shore, and higher broken cliffs on the north shore. There is a line of sand dunes on each side of the stream which are about half a mile in length, north and south, and form a feature in the views of the Head as seen from the southward. A short distance inside the shore-line this tream is only twenty yards wide, it comes through a sharp, deep valley, densely wooded, and the break through the immediate coast hills is quite marked. ..."
"... Double Peak, halfway between Cape Falcon and Tillamook Head, is the seaward termination of a ridge extending eastward ... From Double Peak, the coast extends north-northwestward for 2.7 miles to the mouth of Elk Creek, and then turns sharply northwestward for the same distance to the western point of Tillamook head. The coast is high and wooded, with broken cliffs bordered by numerous rocks, except at Cannon Beach, at the mouth of Elk Creek. ..."